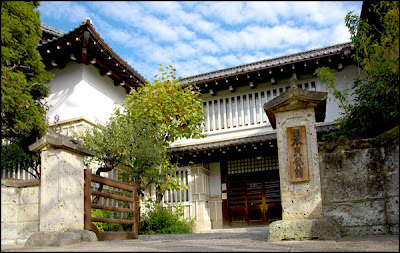 Located in Tokyo, the Mingeikan Museum is housed in a beautiful traditional Japanese building completed in 1936. Founded in the same year, the Mingeikan has over 17,000 items in its collection made by anonymous crafts people mainly from Japan, but also from China, Korea, England, Africa, and elsewhere. Yanagi Soetsu (1889-1961), the first director and founder of the Museum, coined the term Mingei (folk art) in 1926 to refer to common crafts that had been brushed aside by the industrial revolution. Yanagi and his lifelong companions, the potters Bernard Leach, Hamada Shoji, and Kawai Kanjiro, sought to counteract the desire for cheap mass-produced products by pointing to the works of ordinary crafts people that spoke to the spiritual and practical needs of life. The Mingei Movement is responsible for keeping alive many traditions. Click on the buttons for the years of Heisei 16 to Heisei 7. In celebration of the Japanese New Year, the Mingeikan (Japan Folk Art Museum) has organized a special exhibition titled "Otsu-e: Edo Period Popular Paintings," showcasing this traditional Japanese genre of painting from the Edo Period (1615-1868). One of the most popular motifs of these paintings was the goblin, which came into vogue as a decorative theme in the 18th century. Although the goblin is a symbol of evil in religious iconography, in the satirical otsu-e folk art tradition, the symbol evolved to represent human folly. One such work is "Goblin Playing the Shamisen," which depicts a drunken, red-faced goblin immersed in playing this Japanese three-stringed instrument. The farcical nature of this depiction teasingly tells the viewer that too much drinking is overly indulgent. Perhaps suffering the effects of inebriation following a New Year's celebration, people of the Edo Period we are humorously reminded of the consequences of one's actions. Other goblin images present remonstrations against arrogance, hypocrisy and carelessness. After they ceased being sought as Buddhist iconography, the otsu-e eventually evolved into talismans and entertaining artwork sold to passing travelers. Another oft-depicted otsu-e theme is the monkey. In contrast to Japanese folk tales that depict monkeys as clever animals, the paintings portray them as stupid creatures, an allegorical reference to the mindlessness of human beings. One popular motif shown at the exhibition is "Gourd and Catfish," in which a slow-witted monkey attempts to catch a large slippery black catfish using a whole gourd. It shows the futility of efforts undertaken without forethought. Otsu-e like this were often used to demonstrate Confucian ethics and acted as visual texts -- a much more immediate medium than calligraphy -- since the 18th century. I have written about these pictures and their little brother, the pictures of Yamashina, now a suburb of Kyoto.